This is part 6 of our series on how to build a solo defense turtle designed to take full 375k T3-4 hits for lots of Kill Event points. Part 5 looked at the characteristics of the various tiers of troops, and then looked theoretically at 5 options for how you could construct an army for the princely sum of 16 Million troop power. This article will look to perform a series of controlled tests on those 5 theoretical 16M troop power armies, by hitting them with 5 identical attacks of 375k Strat T3 solo marches with the same hero. It will frequently use the new Battle Report Tool to analyze the outcomes of the hits and see who really won the battle, in addition to a new ratio which we are calling the damage ratio. 1) Your attacker has a limited attack size with a maximum allowed march size of 375k (using a 50% march size boost), whilst you can have an unlimited number of troops defending your stronghold. 5 controlled tests were performed, with the first 4 of them on one stronghold, and the 5th attack being performed on a second city with matching hero combat boosts. All attacks were 375k strategic T3, with 125k of each of phlangites, stalkers and lancers. Each attack used the same attacking hero gear setup, which was designed mostly to minimize losses on the attacking end. It was high on health / defense, and had almost 100% attack debuff. This was NOT a test designed to simulate the most damaging attack a big player could throw at a turtle, but merely to get a consistent attack set so that comparisons of the defensive characteristics of the various turtle models could be made. Defensively, both cities were structured with 125k traps, with 120k T3 traps and 5k T2 steam cannons as meat shield. Between each hit, the traps were rebuilt so that they had a full set of traps before the next hit. For the first 4 hits, the hero combat boosts were identical, and the 5th hit was as close as possible to minimize differences between the first 4 tests and the 5th test. For the defensive hero gear, the focus was on relative simplicity, with a greater focus on health and defense, and less so on overall attack, or on individual troop attack. No gear with attack / health / defense debuffs was used, as it is harder to align the magnitude of debuffs in the setting of neither account having 4th gem slots unlocked (as no turtle should). Hero combat boosts for the first city were as per the screenshots to the right. Clear focus on health and defense, troop attack quite low at 45.5% given the lack of special material gear and special material gems with troop attack, whilst individual troop attack was slightly higher than the overall troop attack at 150-190%. 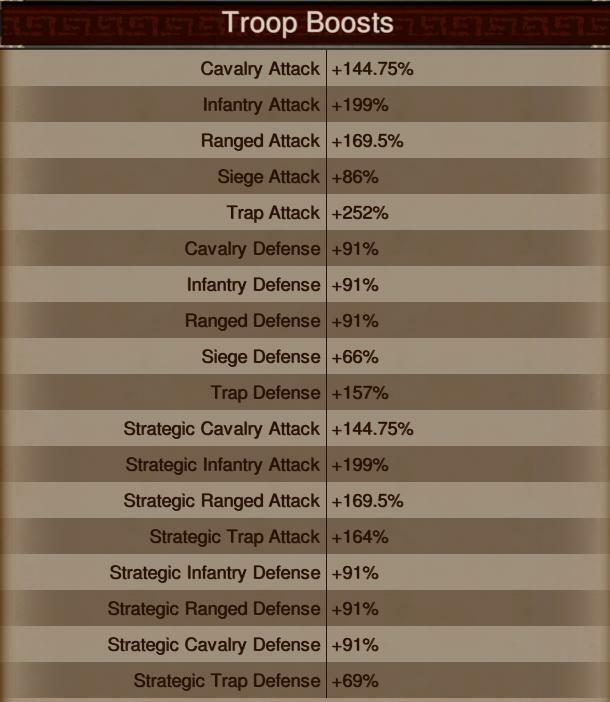 Infantry attack was higher, because this particular account has one level higher infantry attack research than the other two troop types, and you will see that more damage is done to cavalry when we get to the battle reports. Troop attack is lower on these cities to again reduce the losses on the attackers T3s. Sorry, but these tests were expensive enough as they were without added troop attack from the defender. 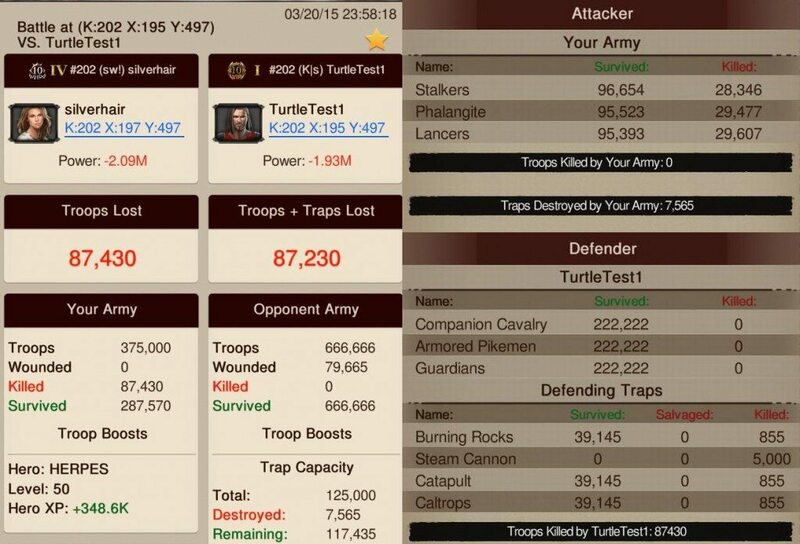 Trap attack is relatively higher at 250% or so, as befits this particular turtle account having a base troop setup of 500k T3 with 125k T3 traps. built using standard materials. Whilst the overall boosts are not particularly amazing, they are at least in the ballpark for alot of turtle heroes that use standard materials at level 50, or a mix of standard gear and relics/cores if below hero level 50. The main reason that health and defense are prioritised in this gear set is because the items with overall troop attack require special materials, and this account did not have enough special mats to craft good gear with overall troop attack. Most of the gear on this particular hero came from the bargain list available on our post on the best bargain hero gear. 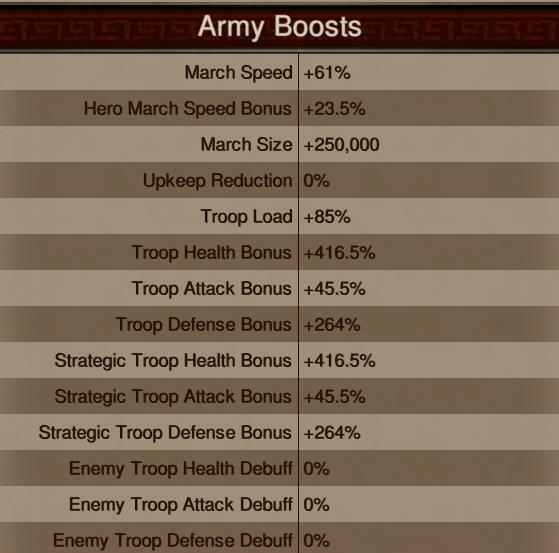 In comparison the attacking hero was using Xena gear, with 247% troop attack bonus, 220-240% individual troop attack bonus, 588% troop health and 623% troop defense boosts. 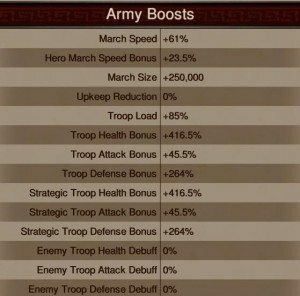 In addition they had 96% troop attack debuff, 36% troop health debuff and 23% troop defense debuff. When discussing the attacker and defender boosts, the most important thing to keep in mind is that the boosts were kept identical for the first 4 tests on both the attacker and defender sides, and for the 5th test, the defender had matching boosts compared with the defending hero on the city from the first 4 hits. They were not identical, but were matched as closely as possible, with most individual boosts being the same value, and some being 0.25% or at worst 0.5% different. The only exception to this matching was that the 5th test on the 8M T1 account had significantly lower trap attack and trap defense statistics, with trap attack of 192% compared to the 252% from the first 4 tests. But I doubt that this lower trap attack made any material difference in an account with 8M T1s. The first test was of the pure T3 turtle, with 666k balanced regular T3 troops. We even made it deadlier by making it 666,666 troops. Double 666 for extra demonic killing power. Here we can see that as per the MZ definition of who wins and loses, the T3 turtle ‘won’, with only smoke rising, and their city not burning. Overall the defender lost slightly fewer troops and traps than the attacker, but only just. They had 79.6k T3 wounded, and had 7.5k T2-3 traps destroyed. All 666,666 T3 troops survived, because they were easily captured by hospital bed space. The attacker loses 87,430 strategic T3, with slightly more lancers and phalangites lost, reflecting higher infantry and ranged attack boosts than the cavalry attack boosts. When it comes to traps, all 5000 T2 steam cannon traps were destroyed, with an even split of 855 of each of the T3 traps lost. All of these were rebuilt prior to the next test to ensure that the base stats were identical between tests. According to the view of the battle presented by MZ, the defender won, but only just. When we analyze the results using our new battle report tool, the results become somewhat more unambiguous. Here it becomes clear that the defending turtle has won on every stat that counts. 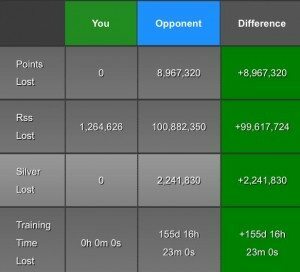 They have given up 1.593M Kill Event points (each hospitalised T3 is worth 20 points), whilst gaining 3.497M points (each killed T3 is worth 40 points). The net points difference here is 1.9M net points for their kingdom. When it comes to the resources required to heal the troops in hospital vs the resources the attacker requires to retrain their dead troops, it is pretty clear that the defender comes out way ahead. And the time required for the attacker to retrain their 87k dead T3 is ALOT longer than the time required to heal the 79k T3 that the defender has in hospital. Each of these numbers can be lower with a higher training time boost, but the differential between healing time and retraining time is huge. This is one of the main reasons you always want troops going to hospital rather than dying. It is just so much quicker and cheaper to heal them than retrain them from scratch. So, the outcome here is a clear win for the defender on every metric that counts. Yay turtle!! The next model tested is a mixed model of even numbers of regular T2 and T3 troops. Again we have a model of 16M troop power, but in this instance, 12M is T3 power, and 4M is T2 power. 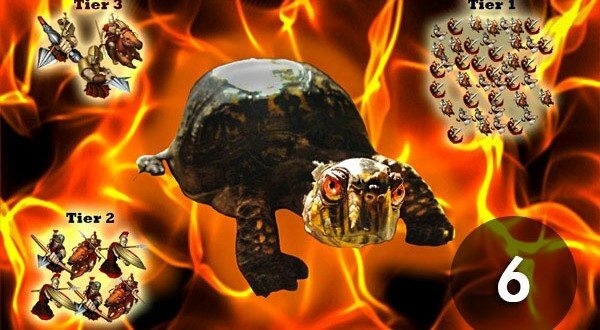 According to the report presented by MZ, this is a win for the attacker, losing 99k troops, and hospitalising 143k troops, so the turtle burns. Of course, this turtle has a T2 meat shield, so they are killing the attacker’s T3s, but only losing T2 wounded into hospital. Again, there are no deaths on the defender’s side, everything goes into hospital. 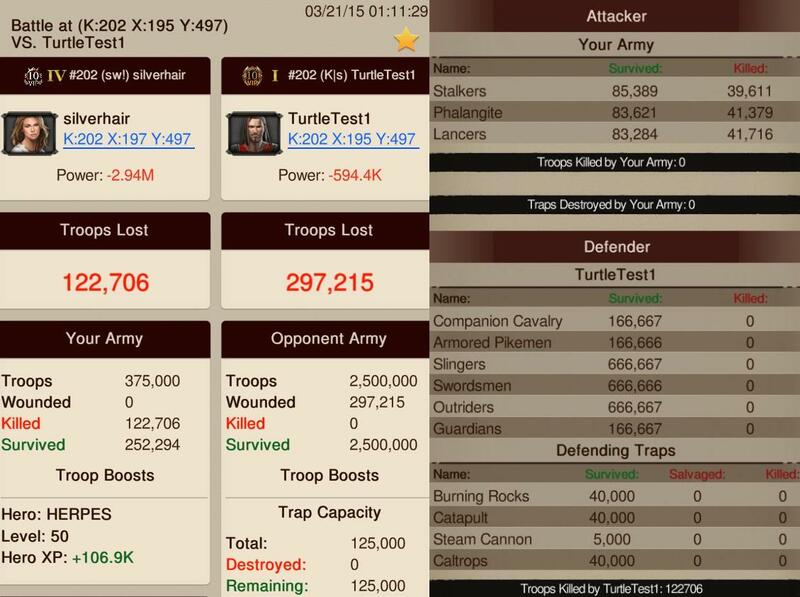 In this instance, there are only 256 T2 traps damaged, a vast improvement over the 7k T2-3 traps damaged with the prior attack using the same troops and same boosts. as opposed to 2.39M power destroyed. Given the introduction of the new ‘Enemy power destroyed’ in player profiles, this is a clear win for the defender. When we analyse the results of test 2 using our battle tool, the difference becomes even more marked. Net Kill Event points is now 3.8M in favor of the defender, with them giving up only 143k points, at 1 point per hospitalised T2, compared to 3.9M points for killing T3 at 40 points each. The attacker requires 44M res to retrain their dead troops, compared to 1.7M to heal the T2. And the time to heal vs time to retrain gets even larger. Again, a clear victory for the defending turtle, who is thanking their stars they built enough hospital beds to cover their T2 meat shield. The next model tested is our second mixed model, this time a mixture of regular T1 and T3 troops. Again we have a model of 16M troop power, but in this instance, 12M is T3 power, and 4M is T1 power. According to the report presented by MZ, this is a win for the attacker, losing 122k troops, and hospitalising almost 300k troops. Of course, this turtle has a T1 meat shield, so they are killing T3, but only losing T1 wounded into hospital. Again, there are no deaths on the defender’s side, everything goes into hospital. In this instance, there are ZERO T2 traps damaged, a small improvement improvement over the 256 T2 traps damaged with the prior attack when the defending force was 1M, whereas this defending force is 2.5M troops. Again, we see slightly more lancers and phalangites killed, as a result of higher infantry and ranged attack boosts on the defender. And the relative power loss is now much more clearly in favour of the defender, losing 590k power (regained with healing troops), as opposed to 2.94M power destroyed. Compared to the prior test, the power lost by the defender has almost halved, whilst the power destroyed has increased from 2.3M to 2.9M. When we analyse the results of test 3 using our battle tool, the difference becomes even more marked. Net Kill Event points is now 4.9M in favor of the defender, with them giving up ZERO points, as hospitalised T1 give up no points, compared to 4.9M points for killing T3 at 40 points each. Points gained has gone from 3.9M to 4.9M just by replacing the 500k T2 with 2M T1 for the same 4M troop power. The attacker now requires 53M res to retrain their dead troops, compared to 1.7M to heal the T2. 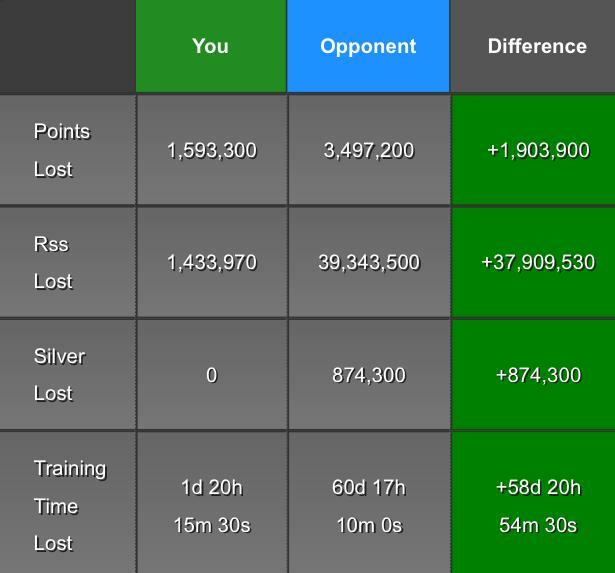 And the time to heal the T1s (INSTANT, ie 0 time) vs time to retrain gets even larger. Again, a clear victory for the defending turtle, who is thanking their stars they built enough hospital beds to cover their wounded T1 meat shield. Getting past 300k hospital beds was quite an effort, but well worth it. The next model tested is our pure T2 model, with 2M T2 providing 16M troop power. According to the report presented by MZ, this is a narrow win for the attacker, losing 136k troops, and hospitalising 144k troops. Of course, this turtle is pure T2, so they are killing T3, but only losing T2 wounded into hospital. Again, there are no deaths on the defender’s side, everything goes into hospital. In this instance, there are only 64 T2 traps damaged, a small improvement improvement over the prior attack that succeeded in damaging 256 T2 traps damaged when the defending force was 1M, whereas this defending force is 2M troops. Again, we see slightly more lancers and phalangites killed, as a result of higher infantry and ranged attack boosts on the defender. And the relative power loss is much more clearly in favour of the defender, losing 1.15M power (regained with healing troops), as opposed to 3.27M power destroyed. When we analyse the results of test 4 using our battle tool, the difference becomes even more marked. Net Kill Event points is now 5.3M in favor of the defender, with them giving up only 144k points points (1 point per hospitalised T2), compared to 5.4M points for killing T3 at 40 points each. The attacker now requires 61M res to retrain their dead troops, compared to 1.7M to heal the T2. And the time to heal the T2s vs time to retrain T3 gets even larger. Again, a clear victory for the defending turtle. One interesting point is to compare the T2 models, this model with pure T2, and Model 4 which has 500k T2 and 500k T3. The defensive losses are very similar at 143,121 T2 wounded in the model with 500k, compared with 144,030 with this pure T2 model. In theory, the model with 2M T2 should have slightly higher intrinsic defense compared to the model with 1M troops split into T3 and T2. As such, you should expect less losses with the army with higher troop defense, all other things being equal. The main difference in Model 4 is that the 500k T2 is acting as a meat shield, rather than the main defensive force. The difference in number of T2s wounded would likely have been more marked had the attacking force been using a single troop type attack. This will be covered in more detail in a future article discussing design considerations when deciding just how large your lowest tier defensive meat shield should be, and discussing the point at which making your meat shield larger results in worse results rather than better results. The next model tested is our T1 monster, with 8M T1 providing 16M troop power. This test was performed by attacking a different stronghold. 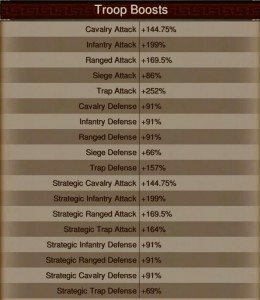 As mentioned at the start of this article, the defensive boosts were kept almost identical, with the minor exception of this second stronghold having lower trap attack and trap defense boosts. All other boosts were the same or at worst 0.5% different. If they were different, they were lower on the model with 8M T1, not higher, i.e. the hero was ever so slightly weaker on this Model 1, so that if there is a bias due to the different hero boosts, it is not in favour of the new city. According to the report presented by MZ, this is the first narrow win for the defender since the pure T3 model, losing 210k troops, and killing 224k troops. The T1 monster smoked, and didn’t burn. Of course, this turtle is pure T1, so they are killing T3, but only losing T1 wounded into hospital. Again, there are no deaths on the defender’s side, everything goes into hospital. In this instance, there are zero T2 traps damaged, much as with the last model with 2M T1. Again, we see slightly more lancers and phalangites killed, as a result of higher infantry and ranged attack boosts on the defender, although the relative difference is more marked than previously. And the relative power loss is much more clearly in favor of the defender, losing 421k power (regained with healing troops), as opposed to 5.38M power destroyed, a ratio of over 12:1. When we analyse the results of the hit on Model 1 using our battle tool, the difference becomes even more marked. Net Kill Event points is now 8.9M in favor of the defender, with them giving up ZERO points points (0 point per hospitalised T1), compared to 8.9M points for killing T3 at 40 points each. The attacker now requires 100M res to retrain their dead troops, compared to 1.2M to heal the T1. And the time to heal the T2s vs time to retrain T3 gets even larger. Again, a clear victory for the defending turtle. And by far the biggest victory of the series. It is pretty abundantly clear why MZ NERFed mass armies of T1 troops. But so far, as of 8M T1 troops, I don’t see a lot of evidence here that they are NERFed. Do you? Having completed 5 tests on 5 different armies of 16M power each, it is time to compare them to each other. The first thing we compare them on is net points. It is clear that they all win on net points, but the 8M T1 account gains alot more points whilst giving up zero points, particularly compared to the T3 account. Some people prefer to think in terms of points ratios rather than net points. This is more of an issue when considering the results of rallies, with some alliances trying to aim for KE points ratios of 3 or more on rally hits. Here it is clear that the results are driven by the tier of troop hospitalised, with T3 coming out at 2, T2 coming in at 27-37, and T1 having an infinite points ratio because they gave up no points due to all going into hospital. This is a direct result of the KE scoring system that MZ introduced when they started Kill Events. Recently you will have seen an addition to your player profile, which is a new statistic ‘Enemy power destroyed’. It is hypothesised that this will be a new way of measuring kill event progress, as a possible replacement for the existing KE points system. Or it just may be another stat that MZ attach to our profile. Here it is clear that the big T1 account destroys at least twice as much power as the pure T3 model and the one with a mid sized T2 meat shield (Model 4). All models only had troops hospitalised, so technically no power was destroyed. Have yet to work out whether MZ accounts for hospitalisations in their Enemy power destroyed stat, but I’m sure it will be worked out very soon.
. As such, more damage has been sustained by the attacker, and the ratio of those damages is 408825 / 288060, which is 1.41, as per the table above. That means that the defender delivered more damage than they sustained. Another win for the turtles. As you can see, the damage ratios are all above 1, which means they all delivered more damage than the incoming attacker. When you compare the damage ratios, you can see that Models 4 and 5 delivered only slightly more damage than the incoming attacker with their hero and 375k strat T3 troops. They still ‘won’ though from the abstract perspective of which army + hero combination was ‘stronger’ in the sense of doing more net damage. 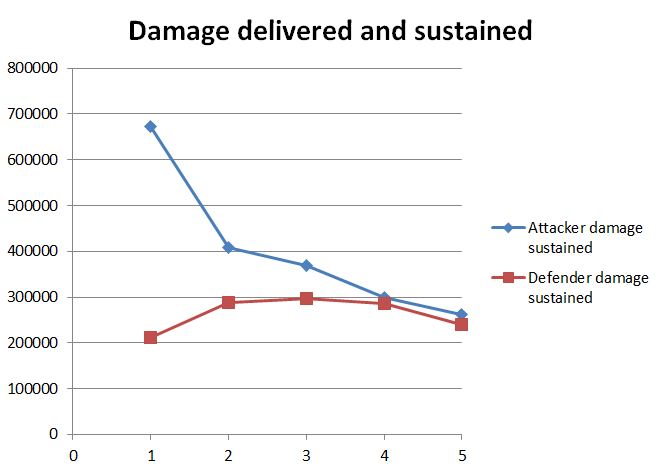 The standout is Model 1, as you can see in the graph below titled ‘Damage delivered and sustained’. Model 1 has a damage ratio of over 3, partly because of a sharp jump in the damage delivered by this model, as well as a reduction in the damage sustained. So, after building and testing 5 model of different army composition, with each of them exactly 16M power, what can we conclude? Firstly, all models succeeded in beating their incoming attacker where it counts, on the Kill Event scoreboard, as well as on the amount of resources, silver and time required to heal wounded troops as opposed to the attacker needing to retrain dead troops. Thanks to the battle report tool, it is now easy to assess how you went against an incoming attacker. Secondly, models with T1 in them as either meat shield or as the main army body, do extraordinarily well on net Kill Event points as long as there are enough hospital beds to cover them. Giving up 0 KE points and instant healing are very important Kill Event attributes. Thirdly, any model that is based around a core of T3 troops is improved by the addition of lower tier defensive meat shields. Both T1 and T2 meat shields improved the overall results of the T3 based models. Fourthly, as long as you are below the NERF limit, and 8M T1 clearly is not NERFed, then nothing beats the awesome strength/power ratio of a mass army of Tier 1 troops. This clearly shows the importance of exploiting Asymmetry 1, that you can have unlimited troop numbers in your city, whilst the attacker is limited to a maximum of 375k troops. Finally, this was NOT a test of hero strength, and not a test of the maximum potential damage that can be sustained by these model armies. Whilst the attacking hero was definitely stronger than the defending hero, it was nowhere near as dangerous as some of the heroes running around in full Xena Valentine or Fire age gear. Particularly if those heroes are gemmed up for a single troop type, and a full 375k march of strategic T4 troops is used, the damage sustained is going to be a lot more than is suggested by these controlled tests. It is also critical to your success to exploit asymmetry 2, the presence and absence of hospitals. This report clearly shows that the costs of healing vs retraining are massively different, particularly if you have lower tier troops going into hospital, and none dying. The guidance on hospital bed numbers remains the same as per Part 4 of this guide. If you have T1 troops, you still need to budget for 600k beds (not the 210-297k suggested by these tests). If you have T2 troops as your lowest tier, then 300k hospital beds should catch your wounded T2 from any single solo attack with current permanent hero gear, as long as you are in your own battle gear with hero tree set. Likewise, 200k beds should be sufficient for any one single solo attack on a city with T3 as their sole troop tier. You of course can have more hospital beds, but please do not assume that because these tests show 79k T3 wounded that you only need 80k beds. You need more hospital beds for real battles. Even on pure T3 turtles, having up to 400-600k beds can be very advantageous for taking multiple concurrent solo hits. Please feel free to play around with the new battle report tool, even if it is just running through hypothetical scenarios on what various combinations of wounded and killed troops does to net Kill Event points. If you take one thing out of that tool, it is that net Kill Event points are critical for success in determining who ‘won’ a battle. The second thing you should take out of it is just how much better it is to heal troops than have to retrain them, both in terms of resources, silver and time. Do not skimp on hospital beds if you are a turtle. Please revisit Part 3 of this series for a discussion of which buildings can be considered for deconstruction, and hence making space for an additional hospital. And now that you have formed a stronger opinion on what kind of turtle army you want, you might need to revisit Part 4 to help make decisions on how many hospitals you need as compared to villas and barracks. The next part of this series will revisit the question of how an existing turtle can modify their army structure, and in particular look at the question of whether an existing turtle should progress strategic research and training strategic troops in addition to their existing army of regular troops. I unlocked t4, both troops n traps. 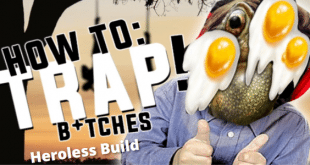 Hi, I love your articles and I tried to build a trap account. 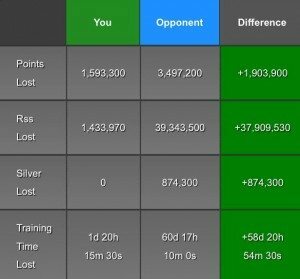 I had 3mill T1 and 1mill T3. My research had been done in accordance to your guides including trap. I had a march from a 35bill player who sent 675k T4 of immortal. Basically he took out al my troops other than those that went to hospital of 475k beds. Any idea where did I go wrong? This series was written before the giant march sizes were released, unfortunately. The troop numbers required are now way higher. I’ve been trying to collect info from awesome solo traps I’ve come across, but have yet to find a common, definitive number/tier. If I come across anything, I’ll try to give you an update. Noted. That’s why I upped the troop count higher also but still failed to take a single hit. I did well against hundreds mill power player who sent 350k of T3 and T4 that I ate them. Now gonna rebuild troops. I have a silver farm account at 158 mil power and planning to make it to a trap account. Can you please advice what kind of troops and traps (regular or strat or both) I should build? I am working on researching troop defense and troop heath as I understand from here that they are vital. I’m a trap account with 40M kill from the past three KE’s we have had and i run with 14M t1 and around 3M t2. I have yet to be nerfed. This upcoming KE, i will test the t2 nerf and go to 5.1M t2 and see what happens. Is the nerf based on t1 and t2 separate or combined. In other words, if the nerf is 10 mil, can you have 10 mil t1 and 10 mil t2, or does the combined number need to be below 10 mil? Hey Darigaaz. Same Darigaaz from K202? NERF appears to depend upon how many T3-4 you have. The more T3-4, the higher your available NERF limit is for your account. It appears to be tier based, so that there is an interaction between T1 and T2 nerf limits, such that you can have a high number of T1 that is not NERFed, but as you add T2 troops, the T1 NERF limit starts going down. One common configuration of T1/T2 that avoids NERF at around your power level is 5M T2 and 15M T1. These limits go up as you add more and more T3-4 troops. Yes, same Darigaaz, but I don’t play in 202 anymore. I’m at 4mil t1 and 5mil t2 on my sh 21 account so it seems like I have room to add more t1! I’m finishing up my second trap account. It’s a SH18 with 500k beds and it will be all T1. I’m about to start my big troop build but I’m unsure on the nerf. I have heard anywhere from 5mill-8mill is the NERF. Since this report has anyone done a test of the kill ratio from when it’s 5mill T1 and scaling upwards incrementally to try and find the nerf? Also when the Nerf happens to clarify that just means any troops over and above that number are essentially unarmed civilians. Correct? Thanks for your help in this as I’m hoping to have this up and running for this weekends KvK. I am quite new to GoW, but very much enjoying it and these guides are a great reference. I am, however, wondering if the change to destroying power for points in KvK (rather than ‘simply’ killing troops) makes these turtle accounts more like sitting ducks than landmines? any thoughts? No sir. If you are set properly you will destroy much more power than them. I can eat full marches depending on gear set up and not one troop dies on my end. Last KVK I ate 5-6 1st marches and took their hero. I wanted to chime in and thank you for a terrific series. I am in a new kingdom with our 1st KvK KE event. I followed your guide on a 100% T2 trap. 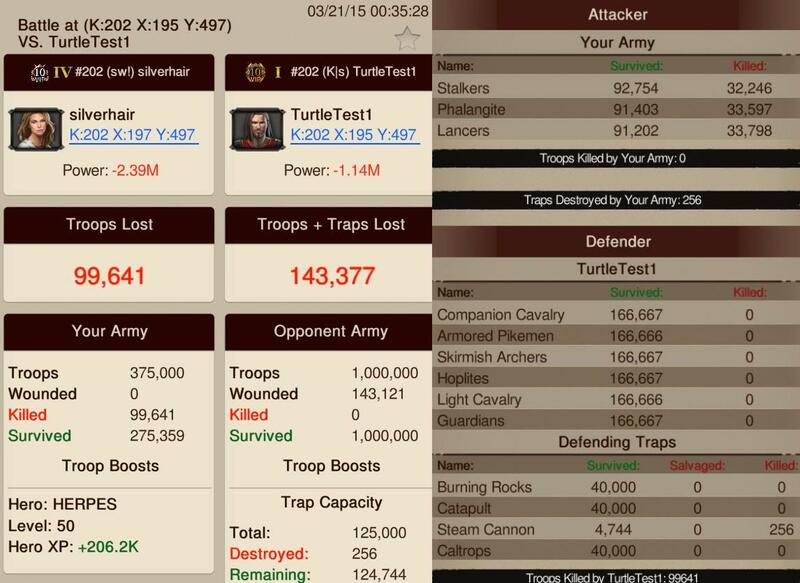 Kept the troop power right at 16M with 52m total power. Ported to the enemy and made some noise and it didn’t take long for a 200m player to come calling. 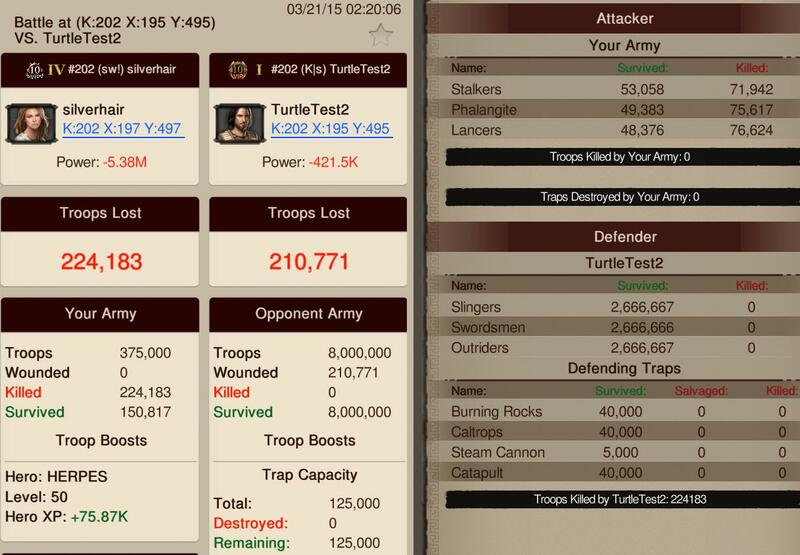 Took 2 solo mixed marches back to back, each hit killing 200K of his troops. 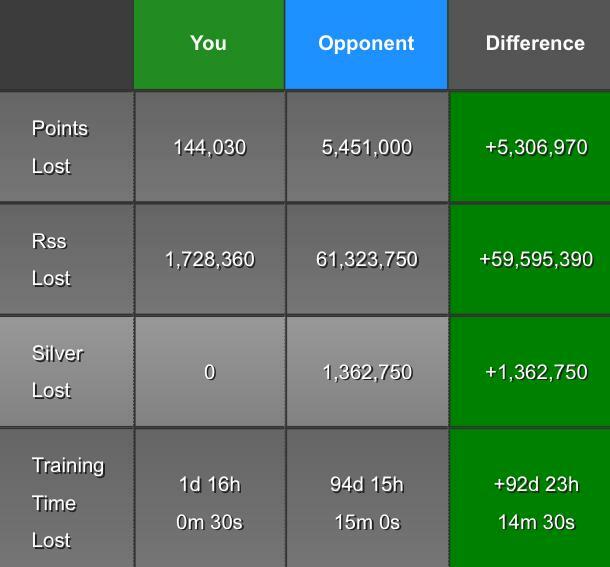 Each hit he lost 2m in power giving me over 4m in points. I easily handled all wounded with 12 L21 hospitals. I’ve just started using my trap city (all research for my lvl20 stronghold completed), but I have not been so successful taking hits from T4 players, who usually use 375k and only one type of T4 (even when I am applying the 75% attack boost). I saw that one of the traps in the article had 416% troop health and I was wondering what type of equipment it had. It would be interesting to see a detailed article about that. I’ve assigned all my hero points to troop health, have a bunch of gear and health gems lvl 6 and still can’t get above 300%. I have the same problem with my troop/trap attack… Any ideas? Just so I’m correct. You dont defend with a varied strat and reg troop defense even numbers across the two….rather you defend using all reg troops? Correct. Either reg or strat. No benefit in defensive situations using a balanced mix of strat and regular. All it really does is double your research cost / power. Read part 8 where the evidence is presented. Thanks. Yes, I read but just double checking! My power is 47m with 520k hospital space. I fear my troop layout might mean a lot of unnecessary deaths because of my T1s getting in the way. What do you tink? Just to confirm….none of these builds use a combination of strat and reg troops? Just reg troops evenly split in numbers? I keep hearing mixed ideas about how it should be evenly split between reg and strat troops! 1) SH21 account? If not what SH level was it? I am wondering if SH level or having researched T3s would invoke the Nerf on your 8M account. It seems like if you research T3 you get nerfed. I have a big(ger) account, about 400M and I want to build as big of a T1/T2 army as I can, and so far 3M each T1 and T2 have not resulting in any nerfing, was curious to know if its saf to push that past the 5M mark. Sh21. You can tell by the 125k traps. Yes, T2/3 were researched. 8M T1 IS NOT NERFED. But you already know that, because you have 9M T1. I have pushed to 12M T1, with 4M of each regular T1 troop type (no siege). Have not pushed any further, because there is not much point for a solo march turtle having more than 12M T1. I just wanted to say thank you Silverhair. 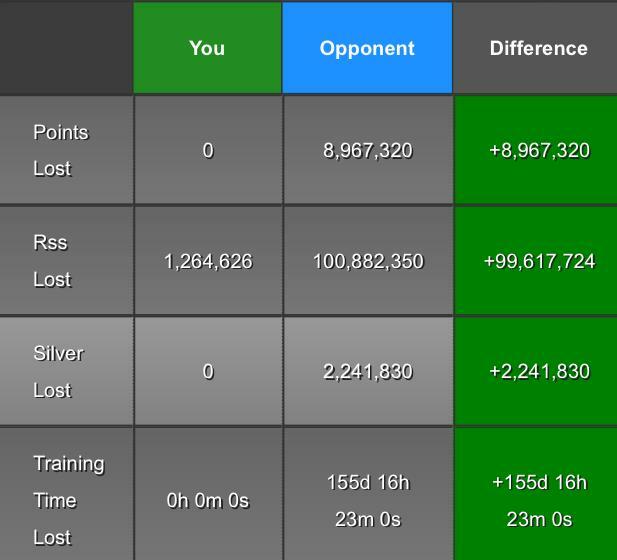 I was getting bored with the game being at 650-700 mill, only action is rallies on 300-500 mill players. I had a sh 9 silver farm when I started reading this article. Bought a $50.00 pack with high roller and built up excessive amounts of speeds and gold for a sh14. I opened t3 troops and walls, stayed shielded for two weeks, built 1 mill T1, 1.5 mill T2 and 1 mill T3. My theory was that I would burn through the T3 to make my stats not look like a trap. I am now a sh21 at 68 mill, scored 160 mill points in my first kvk ke. I have lots of screen shots of my kills, I’m only at 3.5 mill kills but account is only two weeks old as far as combat activity. With hero 49 gear I am able to eat entire marches of heroless T4. If the attackers uses their hero I usually lose about 220k-260k while taking about 10-15% less from them on a full 375t4. I now just got hero level 50, gear isnt that great but I ate an entire march of 250kt4 and lev 50 hero two days ago. I also got soloed by a billion power account with full xena/fire age gold gear. 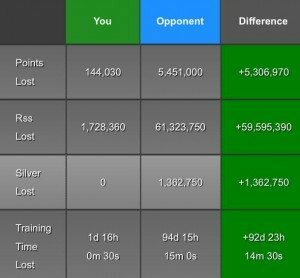 He put 411K T1 in the beds, I killed 187K of his 375k march. Let me know where to send the screen shots if you want them. I have found these articles invaluable. Thank you for sharing your experience and knowledge and thank you giving so much of your time. I am equally impressed that you guys take the time to answer so many additional questions. I started a brand new account on the back of this advice. I am looking forward to reaching the SH18 scenario and testing it out. I am really looking forward to the next article. keep up the good work. It is very much appreciated. Wall traps have to match the troop tier of the defending troops that are being actively wounded or killed. Otherwise they sit idle. This isn’t very well known. This is what is happening when your wall isn’t losing a single trap, your wall isn’t working. I noticed this after eating 2 nearly Simultaneous rallies. I made a 7m t2 buffer. The 2nd rally barely got into my t3. Hit 100k t3 only. And i lost 10k of my t3 wall. I rebuilt the t2, and took numerous other rallies making t1 t2 buffer meat sheilds as the kvk ke progressed. I never lost another t3 troop, or t3 wall trap. I tested this sending 1k t3 into a player with 1k t1 home and 1k t3 traps. I attacked with 1k t3 troops. The wall had 0 Damage. Then he dismissed his 1k t3 wall and built a 1k t1 wall. Guess what? My same attack suffered more deaths and his t1 wall also took damage. So in conclusion, it is actually a bad thing when your wall isn’t losing any traps. It means you wall isn’t involved in the fight. Sorry this is bad news for players that spent a ton on t4 wall traps. The research I have done on T3 traps on my 8M T1 monster concludes differently. I hit it at increments of 5K T3 wall traps from 100k to 125k T3, and the traps definitely do something positive. They are not idle non-participants from the testing I have done. Rallying your hero makes your T1 extremely vulnerable to destruction. Fake rallying with that many troops is not advisable unless you are also hiding the T1 in shielded embassies, or other people’s fake rallied. Yes thank you for the guides. My build is a lvl 14 with maxed research. I didn’t know to hide power. Moving past that I decided to build a lvl14 t2 build with 18 lvl 14 hospitals. My question is do I need more troops for my build to be affective. Your guides are mostly for lvl18+ sh. Im hoping for maybe some info for us smaller sh14 turtle builds. As I am not a spender I feel the lvl14 would be best for me. Thank you again. At lv 14, your biggest defense is going to be gear (which you won’t really get if you’re not spending money) and mass troops. You will lose some troops due to the small amount of beds but if you have enough of them, it will help you. I don’t see how you can have enough troops without spending money either though. I did a test last night , my turtle has 2.5m t1 evenly mixed, 365k T3 and 487k beds (power at 43m) . It has pretty good gear for a turtle . The attacker was told to hit like he would when hitting any turtle. He has almost all research done and awesome gear. he attacked with 75k t3 and the rest t4 strat and ended up taking out 861k t1’s and i killed 81k t4 and 75k t3’s . ouch hah would i have better results if i ignored all trap attack boosts in skills and just focus on troop boosts? he attacked with 375k total troops btw.. Yes. Trap attack is wasted hero skill points when you have almost 3M troops. Really awesome posts Silverhair. Thanks. I have been looking around trying to understand exactly how the KDR was computed, so as to devise a strategy to “keep it down to a certain extent”. I could not find that information. Do you have a hint on the topic ? Ratio of number of troops you have killed divided by the number of your troops that have been killed. KDR goes up with successful turtles because all (or almost all) troops go into hospital, whereas enemies troops are killed. If you kill 100k, and have 500k hospitalised, your KDR goes up, because you have had no deaths of your troops. My account has 300K troops, 220K are t3 and 80K is divided evenly between t1-2… recently i got attacked and i lost all my t1 and t2 while keeping the t3 troops… so my question is, did MZ changed the set up for filling up the beds? why did my t3 took all the beds (which im actually glad as of right now) and my t2-1 just died? No change. Highest tier affected by a single attack takes priority for bed space. MZ hasn’t changed this. My impression is that model 1 is at sh18 but 125k trap is LV21. Did I missed something? All 5 models of army composition were tested at stronghold level 21, so that as much as possible, the variables that changed were minimal. It is certainly possible to build each of these models at sh18, although model 1 is by far the hardest to build at sh18 due to the constraints of barracks capacity at sh18. The decision between the phrase Variant 1 and Variant 2 (presented in part 2 of this guide) was all around decisions on how far you want to push your research levels. More will be discussed on that in the next part of the series. I just built a SH18 500t3 and 2mil T1 account. I decided not to research siege defense and attack. I only trained infantry, Calvary, and ranged. Thought this would keep my power level low and decided it wasn’t available with strat so why waste the power with regular troops. What’s the pros and cons of this? I will be discussing pros and cons of adding strat research and troops to an existing regular army in the next article. Should I complete the siege research and add siege troops to my army. As always, thanks for the articles, very helpful. I’m still not fully understanding the logic behind the 600k hospital beds though. Is this primarily if you are looking to take multiple single hits without healing your T1 meat shield? Am I wrong to assume that in a single battle, 375k T3 (or T4) can not kill more than 375k defending troops? You’re wrong in the assumption. I recently lost 1.2 mil t1 in a single hit against 375k t4. It was a test of my sh 14 turtle that turns out needs a lot more work. As DRetz said, it is certainly possible to kill a lot more than 375k troops with a single march, particularly if the defending troops are T1. The logic behind the 600k hospital bed recommendation is based upon the damage delivered by current best permanent hero gear using either Xena Valentine set or Fire Age gear set, in concert with a single troop type attack (e.g. 375k T3-4 INFANTRY, or 375k T3-4 RANGED troops). In that setting, it is ESTIMATED that 600k beds should catch the casualties from a T1 defending army hit once by that attacking force, that 300k beds should catch the casualties from a T2 defending army hit once by that attacking force, and 200k should catch the casualties from a T3 defending army hit once by that attacking force. These numbers were presented in part 5 when discussing the composition of 5 hypothetical armies, and are a guideline that you should consider. The main variable that will affect how closely your situation matches that estimation of hospital bed numbers is the strength of your hero. If you have a weak hero (or you have fake rallied your hero), then 600k beds will not be enough against that kind of combination of strong attacking troops and strong hero. Excellent job Silver. I am wondering if turtle account has 1m T1 yet. What would be the effect? Does the turtle need to have 8m T1 first before it can handle the blow? No, a turtle does not need 8M to handle the blow. 4M T1 is equivalent in strength to the Model 2 with 2M T2. 2M T1 is equivalent in strength to the 666k T3 from Model 5, which is the ‘weakest’ of this set of armies. As such, my recommendation with T1 is that you need a minimum of 2M T1 to be competitive, and only once you have the research in place, the full 600k hospital capacity and a strong hero, whether using level 50 hero gear or a mixture of permanent 45-49 gear and cores/relics. Having 1M T1, weak hero gears and 375k hospital beds, what is the possibility a hero being captured? I am starting to build a turtle account and I’d like to know if I can play KE while gaining power. Perhaps I am asking for a minimum ‘setup’, meaning no captured hero and no killed troops. If I can heal quickly then I will be ready for next blow. What I am hoping is to win KE gold and continue gaining power ( training more troops and crafting better hero gears, etc.). Thanks. I like previous articles on this series more than this one. It give some ideas about troops setup, but just don’t take it as blueprint. The results maybe very different to what described here, due to cores, rally, heroes, and most important is the experiences of your opponents. Need time to get used to play with a turtle account. Last but not least, rebuild from zeroed turtle accounts take much much more time than from your “normal” castle setup. Each to their own, Nguyen. Some people like the more theoretical approach taken in Parts 1-5, and some people prefer seeing the hard data that is battle reports. Completely agree that the results will be completely different in real battle, and that the results will be largely determined by the experience of your opponent. This was a controlled test with very tightly defined parameters. As I said in the conclusion, this was not a test of the strongest attacking hero and strongest attacking force against these model armies. This was a test designed to examine the relative differences between the different army compositions, using the same attacking setup across all 5 tests. Again, completely agree that the consequences of being zeroed need to be taken into consideration in deciding how you are going to build your turtle account. Having 600-800k beds full of T1s is very discouraging if you have lost 90% of your army, and now don’t have the barracks to retrain them. This will be discussed in the last part before the summary piece, in an expanded discussion of sustainability of your design. IT is very hard to stay a turtle forever. Max sh14 research. Get a full T2 wall of 4k T2 traps. Train a lot of T1 troops. Try and get hero level 50 as quickly as possible. Drop tags during Kill Event so you can’t get rallied. I am also trying a SH14 turtle build. I am curious how many t1/t2 troops and hospital beds would make sense. Obviously there is a lot of missing research compared to a SH21 (especially health). Probably I’d be trying to bait a SH15-20 player with t3 troops. My standard gear is green (lame), and my gems are level 4-5 and all over the place. So, I had planned to use core gear so that I don’t have to pry out gems. I understand defense and health gems. What about trap gems, and the three attack gems? Do you mix those evenly on balanced t1 troops? Good set of guides you’ve got here! It’s a bit too late for me to become a turtle as I started playing with a lack of info on how to properly build one. I’ve built myself into a trap tho with lots of beds and minimal troops. I’ve been doing well so far in kill events. My question is I’m about to unlock t4 troops. Should I dismiss my t2 troops or build more of then as I start producing t4s? Asking cause I’ve got about 400k beds and I don’t want to have my t4 dying in place of t2 put in the hospital. (Assuming I take multiple well timed marches). Depends upon whether you intend to take solo hits or move up to taking rally hits. There is a bit of a dead zone between 50M power and 200M power where you are way too big to take solo hits, but not yet set up to safely take rally hits. You can certainly go on the attack, and grind out points one stronghold at a time, but it is slow, hard work to get gold. If you are going to be taking rallies, do not dismiss your T2 troops. If you are going to be taking solo hits, you definitely want something in front of your T4, as hospitalised T4 are 100 points, just as much as killing them. You have to protect those new T4s however possible. Your two new best friends are 3-day shields, and random teleports. Shields to keep your T4 safe when not fighting, and random teleports to get you out of harms way when sending your T4 to join a rally, and avoid being rallied yourself. Would definitely like to see the results from T4. I’ve learned from experience that T3 just won’t do it against T3 traps with just about anything behind them. The purpose of this test was to look at the relative differences between 5 defensive armies. Whilst I could have used T4 instead of T3, sorry, I economised. I already spent a lot of res / gold to train 2M T1 and 2M T2 to add them to an existing 500k T3 turtle, for testing the models 1-4, in addition to losing the T3 on the attacking side. All of those res required to heal and retrain from the battle report calculator on both sides are my losses. To bring you this test cost me over 1B in res, and around 500 days of speedups, but that is the cost for speed training 2M T2 and 2M T1 (and then discarding 1.5M of the T1). Adding T4 losses on top of that was a touch too rich for my tastes. Please feel free to replicate the tests and substitute your own T4 then report them publicly. For what it is worth, substituting T4 for T3 would have made almost no difference to what happened to T3 traps, with the minor exception of the test against the pure T3 turtle with 666k T3. That is because of the presence of large numbers of T1-2 troops in all the other defensive armies. T4 would not have a changed those results on traps in any material way. Thanks Silverhair! And please don’t take what I said as a complaint, just a wish. 🙂 I appreciate all the effort that goes into this. I am considering it, but you will likely find that the recommendations are going to be very similar to the weighted list on our best combat gear page, using the DEFENSE tab and the BARGAIN tab. In principle, overall troop attack and troop health are the two most important components to build your gear around for a turtle designed to take solo marches. You can filter the gear list by Hero level (for those not yet at hero level 50), and expand the list to up to 20 pieces of equipment per item slot. I wish this test would have been done with single troop type attack since this site touts that as the way to go. I will be covering the relative differences between balanced attack vs single troop type attack in a future article. The purpose of this article was to look at DEFENSIVE properties of 5 different armies. Yes, the big KE risk with pure T3 defensive turtle is that it is easy to win on points by hitting it with a thick T1-2 meat shield protecting your T4 attacking force. Of course, if they are behind anti-scout, these 5 armies look identical, so there is no way of knowing whether there are 666k T3 there or 8M T1. This is an amazing series – thank you! Would have loved to see this with a t4 march instead though. My pleasure. Glad you are enjoying the series. Feel free to replicate the results with T4 yourself. As a reminder from part 5, T4 are ONLY 50% stronger than T3, but require 6-7 times as many resources to train, 50 times more silver, take twice as long to train, and give 2.5 times as many KE points compared to T3. Has there been any testing on adding t4s into the report? I would love to see the difference. Also, as kingdoms become stronger, how would you add t4s into the turtle? No, T4s will not be added into this report. This series of tests was designed to test the relative DEFENSIVE differences between 5 armies, not the absolute differences in strength between attacker and defender. T4s are ONLY 50% stronger than T3s, so given everything else was almost identical, you can do your own estimation of damage delivered and sustained by substituting T4 for T3. The interpretation of the differences between the defensive armies does not change by substituting T4 for T3. Wow..thanx Silver.,..I going right way as you suggested,..already was going with t1s and now it’s 100% sure I will stick to same.,.thanx a lot. ..good job bro…. Awesome Awesome article. I really have been enjoy this turtle series. So well written with evidence to support your theories, which so many times in other articles on the internet, their “evidence” has so many fallicies. I would like you to do an article for hero gear and gems, as in which gems/gear are best for turtles. What I have found from other places is that MZ’s attack boost used by a defender is actually better than using the defense boost when defending. Therefore I was more inclined to think that attack boosting gems/gear would be better over defense gems/gear as a turtle. Please provide your expertise on this. And thanks so much for your time and effort placed in writing out these great articles. The defence list is dominated mostly with more recent gear that boosts overall troop attack or troop health, with almost everything on that list requiring special event materials. The bargain list of gear using only standard materials does not have any pieces that have overall troop attack in them. How valuable is the defense score on a turtle account? Should I use a defense gem in every item, or would it be better to just use one health gem and two basic attack gems? T4 would be a lot of fun to see, but I am sure it’s tough to find an account willing to throw that many t4 away just for the sake of tests. They will injure/wound more in the worse case scenarios, but the points lost for t4 are quite large. T3 is more effective to test, but T4 would be more…realistic? I’m also curious about single troop attacks, since unless the people attacking are new, they would be sending mono. Using 375k T4 would not be more realistic (at least, not for me). I never attack with 375k T4 without a meat shield (usually T2). And the meat shield size would have to vary to avoid losing a T4 troop. The whole purpose of a controlled test is to isolate a many variables as possible and only change a selected few variables under examination. And all the variables being examined here were on the DEFENSIVE side, not the attacking side. Fair point(s). Its been a good series, thanks for the time and rss put into this ;). Something strange happened to me. I have a mix of T1, T2 and T3 meats and some T4 troops. My wall is mainly T4 with some T3 traps too. I was hit by a full rally but didn’t lose my hero. However, I noticed that all my T1, 2 and 3 were killed, with my T4 taking the hospital beds instead! I thought lower-tiered troops get there first?